A number of distinguished guests gathered to hail the £2million raised by Muslim youths for British charities at the Houses of Parliament last week. Lords, MPs and heads of charities and embassies were among the 70 guests at the Ahmadiyya Muslim Youth Association’s (AMYA) annual Mercy for Mankind Parliamentary reception on Wednesday March 2.Mercy for Mankind, a charity campaign set up by AMYA, has raised more than £400,000 for 42 different charities in the past year, bringing their total to more than £2million. 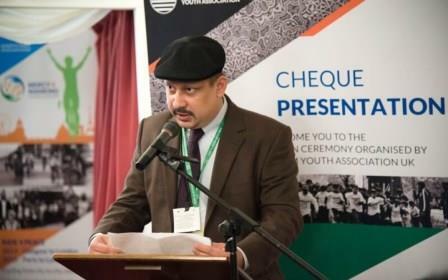 National AMYA president Mirza Waqas Ahmad said the Mercy for Mankind volunteers wanted to fight negative stereotypes through their work.He told guests: “The motivation for our work is our religion, Islam, but today Muslims are in the press for the wrong reasons and our religion is being hijacked by those who profess to follow it but nothing could be further from the truth. “The truth is that Islam has taught us that serving others is a great means of getting God’s love and nearness.”Through their fundraising efforts — which have included store collections, a Paris to London cycle, a hike in the Bavarian alps and 10km runs in Manchester and London — AMYA hope to give young Muslims a chance to spread goodwill and harmony across the UK. At this year’s reception, held in Parliament’s top functions venue the Cholmondeley room, the group presented Royal British Legion, Barnardo’s, British Heart Foundation, British Red Cross, Save the Children, Marie Curie and Great Ormond Street Hospital with donations.Speakers at the event were full of praise for the humanitarian and community work carried out by AMYA’s 5,000 volunteers. Justine Greening, MP for Putney, Roehampton and Southfields and international development secretary, said: “In many respects the Ahmadiyya Muslim Youth Association is one of the hugely bright spots of our community.“Whether it’s the day to day work that the youth association is doing or the works that the youth do for raising money, we can be really proud of that. Share the post "Mercy for Mankind: Young Muslims who raised millions for British causes celebrated at houses of parliament"